To make patching easier for first time users LightFactory now provides access directly in the channel display. From the "View" menu you can choose to view the channels in patch mode. 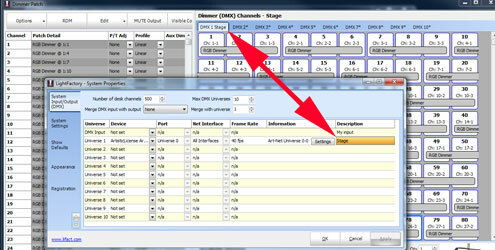 You can then click on any channel to assign or edit the fixture or DMX address. The new interleave option can be used when creating a chase from the selected fixture. Used in conjunction with the "Fixtures per step" to create staggered chased across a large number of fixtures. When building matrices you can now automatically assign channel numbers with a vertical priority rather than horizontal. When copying a chase, timeline, profile or matrix effect you can now shift the channel numbers used by an arbitrary amount. Values can be positive or negative. 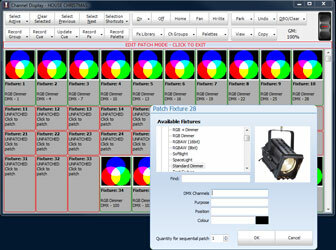 This allows you to build an FX for one group of fixtures and then copy it to another group. The UDP command interface can be used to send and execute commands in Lightfactory using a connectionless protocol. The Telnet protocol requires the client to maintain a constant connection with LightFactory whereas using the UDP protocol commands can be sent to LightFactory in a more ad-hoc manor. When working with a number of universe is can be convenient to label what each universe is used for. 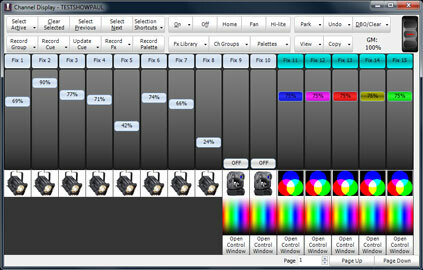 Descriptions set in the system properties for a universe will show in the dimmer patching and raw DMX view for each of the corresponding tabs. The mute DMX output button will temporally stop DMX output to all universes. The global timecode offset is a way to move incoming timecode values by a fixed amount. This can be useful to keep timecode values in your show normalised regardless of the actual values being sent from the external source. Several minor improvements have been made to the timeline effect for 2.9. UNDO - A button in the top left corner of the timeline editor can be used to undo the last operation. 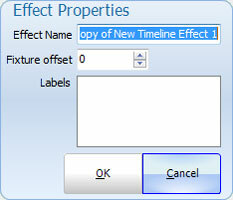 The segment properties frame has been moved to the bottom of the window so that the timeline does not resize when this is displayed. 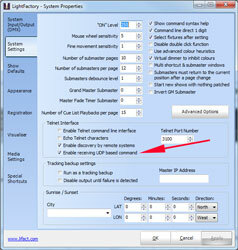 A new option has been added to the right click menu to shift all segments by a specified amount. In addition to the other timeline changes you can now associate a audio clip with the effect. The audio file is visualised as a waveform above the rest of the timeline so that timing references can be made. The audio file will play with the effect allowing lighting cues to be seen in time with the clip. Version 2.9 introduces a completely new media payback engine. The first feature of this new engine is the ability to set the scaling algorithm to be use and the native output resolution you want the video scaled to. 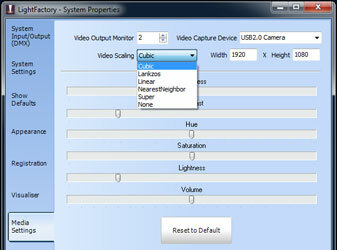 If no scaling is selected then the native output resolution will be determined by the first video that plays. The new media playback engine supports playing multiple video files simultaneously. In previous versions LightFactory limited the video playback to one video at a time. Multiple videos can be faded in and out using submasters. Cue lists can now cross fade between videos. A seek bar has been added to the media effects editor window so that you can move to any time in the media file to find a start or end point without having to play the entire file. 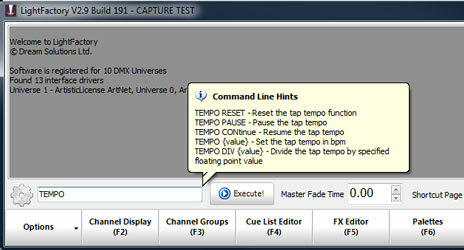 To help control the tap tempo functions in LightFactory you can now directly access it trough the command interface. The audio trigger functions in LightFactory have been redesigned with a more flexible interface and the ability to set multiple trigger events. The new system can now trigger shortcuts, submasters and send commands. The trigger level can be configured to take either the average within the frequency range or trigger when any frequency exceeds the set level. The graphical interface makes setting the frequency range and trigger level easier by simply dragging the threshold lines. For uses who are working with small channel numbers a new view has been added that will show each channel as a fader. The position and colour can also be set directly from this view.